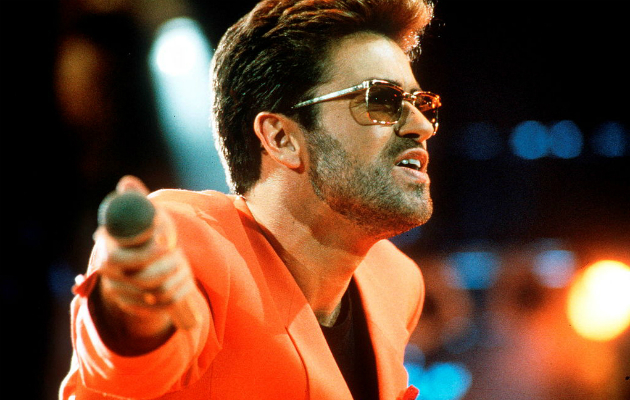 Even though he was in the midst of legal wrangling with his record label in the early '90s, George Michael still managed to find ways to have hits. This week in 1993, he debuted with his third consecutive non-album single, keeping himself in the ARIA top 50 for another year. And in a sign of things to come, it was released by a different record company. Lenny Kravitz was keeping himself at the top of the singles chart this week in 1993, with "Are You Gonna Go My Way" spending its fifth week at number 1. And at the other end of the printed chart, Guns n' Roses' "November Rain" finally bid farewell to the top 50 in its 41st week among the country's most popular singles. This is what happens when you let someone else sing lead... and when you release a dreary, forgettable song as the first single from your second album. Watch out for Kelly Hoggart/Kellie Crawford introducing herself as "Tammy" at the start of the video in the link above. With debut single "House Of Love" still firmly ensconced in the top 10 this week, it was joined by the follow-up. No, not "Gold", which would end up coming out in Australia later in the year. Instead, Australia skipped ahead to East 17's third release, "Deep" - and what a good move it turned out to be, with the British boy band registering back-to-back top 10 hits. With its pop-meets-rap sound and suggestive lyrics (including the dodgy "I butter the toast/If you lick the knife" line), the foursome solidified their cred as music's coolest boy band. Wendy Matthews certainly thought outside the box when it came to the cover versions on her second album, Lily. Instead of remaking familiar songs or previous hits, she opted for tunes most Australians wouldn't recognise. "The Day You Went Away" had been a cover of an under-the-radar release by Soul Family Sensation. 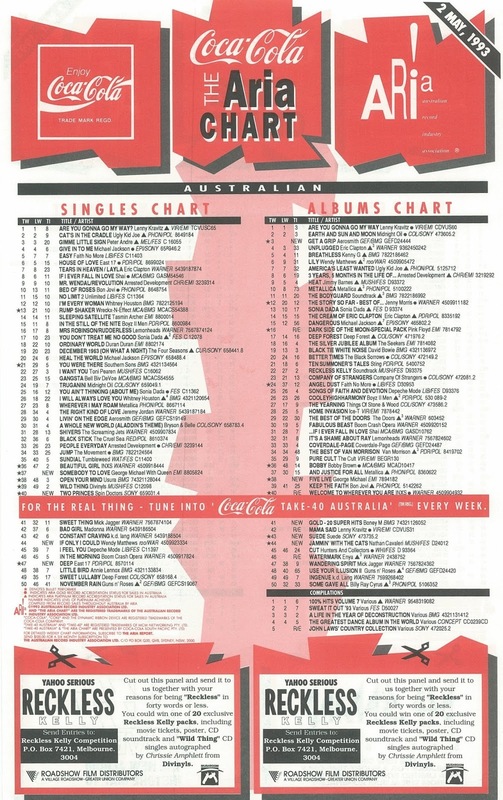 And the album's third single, "If Only I Could", was a reworking of Sydney Youngblood's 1989 breakthrough hit - a top 10 single across Europe but a song that hadn't even entered the ARIA top 100. I'm not a fan of Wendy's version of the song, which traded in the dance club vibe of Sydney's original for something a bit more RSL club. "Little Miss Can't Be Wrong" had put Spin Doctors on the radar, and this massive follow-up from the Pocketful Of Kryptonite album made them inescapable. Written when singer Chris Barron was still a teenager, and influenced by his interest in all things Lord Of The Rings, "Two Princes" was the kind of jaunty pop/rock that provided some respite from the angst-ridden grunge pouring out of the US. So massive was the song, however, that it proved to be the band's own kryptonite, overshadowing everything else they ever released. As a result, they never returned to the top 50 again. In late 1991, he'd released a live duet of "Don't Let The Sun Go Down On Me" with Elton John; in 1992, he'd contributed "Too Funky" to the Red Hot + Dance charity project and in 1993, George Michael's sole musical offering was the Five Live EP, which contained a couple of tracks from the previous year's Freddie Mercury tribute concert and more live recordings from his Cover To Cover tour. 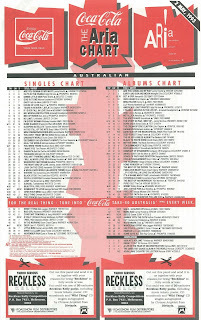 In the UK, the EP had debuted at number 1 on the singles chart, while in Australia Five Live was allocated to the albums chart (and reached number 17) and lead track "Somebody To Love" was lifted as a single. Originally a number 15 hit in Australia for Queen in early 1977, the live version was a rousing rendition and certainly a highlight of the tribute event. This would be the last time we'd see George on the top 50 until his return to music with "Jesus To A Child" in early 1996. Next week: One of the year's biggest hits blends rap with reggae, while one of the year's most hyped UK indie bands make their only ARIA top 50 appearance. I remember seeing 'Baby It's You' reviewed in Smash Hits, but didn't hear it until looking it up out of curiosity on YouTube several years ago. It was a new track too, not from their album released just before Christmas '92. I didn't like the 'soft' side of East 17 nearly as much as their 'harder' sound, on tracks like 'House of Love', 'Gold', and 'It's Alright'. I thought 'Deep' was where they merged into boy-band territory. I'm not a huge fan of Wendy's rendition of 'If Only I Could' either, despite uploading it. The original was much better. I hated 'Two Princes' at the time, if only for its ubiquity and how generally inescapable they were at this time, as you say. But now I can stomach it in small doses. I wouldn't have picked that their career would effectively be over in Australia after this song, though! I'm generally not a fan of live singles, and didn't care for 'Somebody To Love' at all. Wendy Matthews trading in dance club for something more RSL club…ha! Love it.